Souleymane Coulibaly scores the Posh goal against Sheffield United. Photo: Joe Dent/theposh.com. 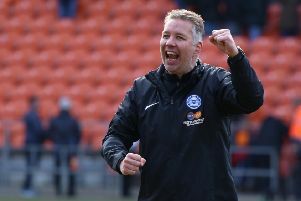 Peterborough United were outclassed at times by a slick Sheffield United side tonight (August 18) which is reflected in Alan Swann’s player verdicts. Substitute Souleymane Coulibaly was also awarded the sponsors’ man-of-the-match award despite playing for just 40 minutes or so.